THE HESLOP HOUSE: MASCARA ANYONE? O.K. ALL YOU FAITHFUL MASCARA USERS, THIS POST IS DEFINITELY FOR YOU. I HAVE BEEN SEARCHING, AND SEARCHING, AND YES STILL SEARCHING FOR THE PERFECT MASCARA; ISN'T TWELVE YEARS LONG ENOUGH TO HAVE TO SEARCH?!!! ( my parents wouldn't let us wear makeup until we were 16) MOST WATERPROOFS TAKE YOUR EYELASHES OFF WHEN IT FINALLY COMES OFF, SO I TRY TO STICK WITH THE REGULAR KIND. I HAVE TRIED EVERYTHING THAT COMES OUT, BUT I AM KINDA CHEAP, SO I HAVEN'T TRIED THE COUNTER STUFF, DOES IT REALLY WORK THAT MUCH BETTER? 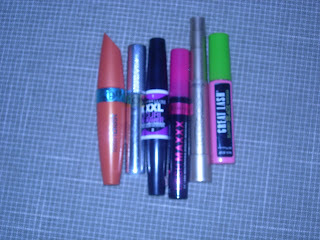 THESE FEW ARE JUST MY LATEST PURCHASES, BUT AS MY HUSBAND CAN ATTEST, I HAVE HAD DRAWERS FULL OF HALF USED MASCARA. I DON'T REALLY KNOW WHY THEY STATE " NO CLUMPING FORMULA" ON THE BOTTLE CAUSE NO MATTER HOW HARD I TRY, THE CLUMPS ARE ALREADY THERE. AND DOES ANYONE ELSE HAVE A PROBLEM WITH ALL THE MASCARA COMING OUT OF THE TOP OF THE BOTTLE? OR AM I JUST SLOPPY? I CAN'T STAND IT WHEN IT STICKS TO YOUR LASHES AND MAKES IT LOOK LIKE YOU HAVE FOUR LASHES INSTEAD OF FOURTY! WHEN IT COMES TO MY LASHES, I HAVE MULTIPLE PROBLEMS; THEY'RE TOO LONG ( YOUR PROBABLY THINKING WHY IS THIS A PROBLEM) BUT SERIOUSLY THE MASCARA JUST GETS ALL OVER YOUR LID, AND WEARING GLASSES OF ANY SORT IS A TASK, SECOND, I HAVE THIN ONES SO I NATURALLY WANT TO MAKE THEM THICK, HENCE THE CLUMPING PROBLEM. IS THERE NOT A MASCARA THAT CAN FIX ALL THESE PROBLEMS IN A SINGLE TUBE? SO, TO ALL YOU HAPPY, FAITHFUL, LOVELY LASH, MASCARA USERS, A TIP WOULD BE GREATLY APPRECIATED. I'M CONFIDENT ENOUGH TO SAY IF I TRY IT AND LOVE IT, YOUR NEXT TUBE IS ON ME! BUT BEWARE, I'VE TRIED MANY. MAYBE I SHOULD JUST WEAR FAKE LASHES? I so know what you are talking about!!! Lately I have been sticking with the pink and green tube, what is that?? Great Lash Mayb.?? only the black stays on!!!! I must say that I have tried Estee Lauder and was NOT impressed :( Good luck!!! Well, I don't really think there is a perfect mascara, but I have found one that I think is the best. It's the L'Oreal Voluminous, but sometimes it can be a little clumpy. Anyway, good luck in your search. Let me know if you ever find the perfect one. I like the L-Oreal Lash Architect (curved brush) mascara, and I just started using the Maybelline Lash Exact, which is pretty good, too. I throw in another vote for L'Oreal Voluminous and I even use the waterproof and it comes off. I only have the clump problem for the first couple of uses out of the tube, after that it is perfect. I love it. Ok, I here Sephora is the best!! Go to Sephora.com and check it out. I have a friend who swears by it. I don't know why I feel compelled to write something here. Maybe its cause I swear by my mascara? But I like waterproof Covergirl the blue bottle however this requires applying which has become a task but when I do and I curl them with a revlon curler I am quite content with my lashes. But mine are slightly thick and almost long? Stuff that isn't waterproof ends up all over at the end of the day, maybe I shouldn't rub my eyes either though? Oh yes good old vaseline takes my mascara right off and you only use a drop of it. I have a solution for clumpy mascara. You know when you think you must retire your bottle even though there is still some left because it just clumps on the brush? Well just add a drop or two of water -mix, and presto! Back to the liquid that coats individual lashes. Roomate secret in college. I think the best mascara that I have found is Mark Make It Big. It seperates my lashes super great, and I don't have a problem with it clumping. I definately think it is the best mascara out there!